Product Description Talking, dance, listen. 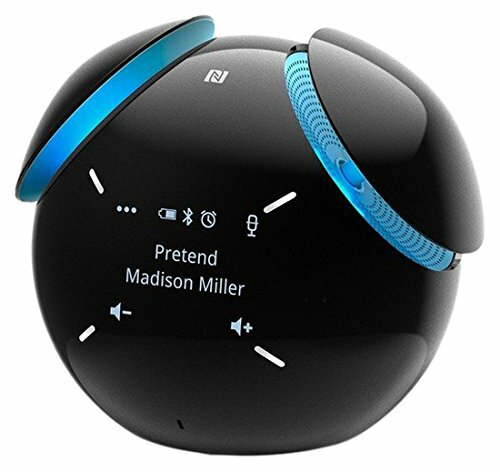 Enjoy more every day Smart Bluetooth (R) speaker ◆ corresponding to the voice control (*), smart wireless speakers By connecting with Bluetooth (R), you can play the song voice. Also, when talk, weather and schedule, the message is that also performs notes operation in addition to the LED lights and display not only me read aloud by voice, you can enjoy a more familiar presence. * Smart you need to install the Bluetooth Speaker application and voice control applications ※ Android (TM) 4.4 or more, as well as Bluetooth profile A2DP, AVRCP, corresponding to the HFP equipment ◆ hands-free communication is possible Can be connected with Bluetooth (R), it can be hands-free calls using the built-in microphone. You can voice control the transmission, you can call if touch the speaker body incoming. It is also useful when making a conference call. ◆Enjoy the music in the music dance Equipped with a function of a speaker body to action to fit the music. To the music, the speaker cover movement, LED light will synchro. In addition, you color the music in a variety of actions such as the body is moved forward or rotation.